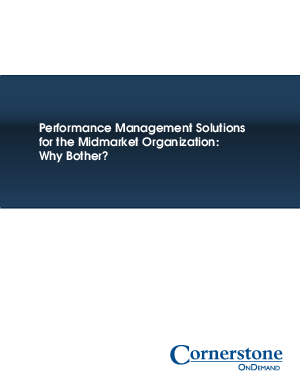 Offers > Cornerstone OnDemand > Performance Management Solutions for the Midmarket Organization: Why Bother? For many employers and employees, the annual performance review is one of the most dreaded days of the year. All too often, managers aren’t even sure how to assess employees when they are confronted with a blank performance evaluation form. Even employees who believe they are performing well will walk fearfully into the annual review because they aren’t sure on what basis theyare being assessed. Everyone involved in the performance management process has wondered thesame thing at least once: Why bother? At companies in the midmarket segment, businesses withroughly 250 to 3,000 employees, performance management may seem like an unnecessary annual bureaucratic exercise.